Introducing Skwezed 100ML, crafted and distributed from the beautiful hot and sunny parts of California. Specially crafted with only the best quality of food extracts that’ll not only taste but smell like the vape juices they claim to be on each package. 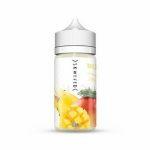 Skwezed is one of the most well-known companies and one of the top recommendations as well for first-time vapers since they have simple and basic flavors that aren’t harsh or overwhelming to the taste buds. Every flavor with its fruity goodness comes with a gushing amount of flavor that’ll satisfy your every need from nicotine to cravings (also maybe just for cravings for those who have cut back on nicotine all the way, which congratulations by the way!). Skwezed vape juice comes packaged in 100ml chubby gorilla bottles to prevent any damages when being shipped around. It even prevents damages at home in cases like bottles beings broken and end up having no juice at all. This premium vape brand was created in the thought and encourage for people who want to cut back on smoking analogs. Finding alternatives can be so hard at times, but companies like these make it easier especially when they have such a wide range of delicious, amazing flavors that make you forget all about the harsh cigarettes. Skwezed ejuice is one of those vape juice companies that makes sure you get the full experience of enjoying vape with a splash of flavor in every hit. Grapefruits, in general, have a bitter taste which isn’t favored by some, but for those who are crazy for grapefruits, this juice would be the best match for you if you’re in search on a deep grapefruit flavor. Grapefruit by Skwezed captures that bitter taste and has a slight faint sweetness to it that an actual grapefruit would have. It’s not harsh in flavor and has more than enough in taste to where you can taste the grapefruit and not get tired of it. Just like biting into a fresh juicy grapefruit you’ll get a gush of bitter sour on the inhale tightening every taste bud it touches, along with that faint sweetness that’ll soothe the happy taste buds on the exhale sending on the deliciously scented cloud of vapor with it. Don’t miss out on the tart dewy taste of ripened Green Apples all in one blast from a vaporizer. Green Apple by Skwezed 100ml provides you the true and honest flavor of the heavenly fruit known as the green apple. It’s sweet, and tart taste drives many wild, which usually brings a smile to your face and your thirsty taste buds. It also pleases everyone else around you for its fruity and floral scent once it’s out and about in the air. Vaping on this juice is similar to having that nice crisp bite into the apple and gathering that first burst of flavor coating your mouth on the inhale, while on the exhale you’ll get that slight nectareous kick in its taste leaving you astonished of its exact similarity you’d get when chomping into a fresh green apple. Lychee by itself is a unique fruit due to its sweet, tart, and floral flavor. It’s hard to compare it to any other fruits, but many say it’s like a pear merged with a watermelon or a grape with a rose. It could be all four mixed into one flavor because it’s hard to target the exact flavor that it hands off especially while vaping. It’s got such an amazing fruity taste, it’s an exquisite combination of hints and tones is what keeps things exciting and worth vaping on. Lychee by Skwezed grasps every inch of this flavor even the slight touch of floral which you just smell more rather than taste when vaping on this savory juice. You’ll get a burst of mouth-watering syrupy like taste that’ll drive any fruit lover crazy on the inhale, and on the exhale you’ll get a gust of the floral scent mixed into the delicious taste of the lychee making it one heck of a juice to find. Mango by Skwezed mimics that thick honeyed taste that mangos always have. It’s made for the intention of tasting just like a mango since you can’t go wrong when you go for this popular fruit. It’s lush intense flavor or mango will satisfy your every craving if you’re in need for the perfect mango based flavor vape juice. Since most companies try their best to come up with the right mango flavor a lot have not succeeded, most are too overwhelming or very bland in taste which is super disappointing. But Skwezed ejuice has hit the nail on the head when getting just the right amount of flavor into this juice. On the inhale its just mangos mangos mangos, and on the exhale it’s more mangos giving you honey and nectarine all in one puff that hits the spot. Milk Teas Krem is crafted for those who love fruits with a nice smooth milky kick to it. It’s made of yummy peach tea with a splash of milk to save the day. Milk Tea Krem by Skwezed may sound like an odd combination but trust me, the flavor is to die for. Take time to dip your tongue in the lush milky feel of herbs and peaches; it’ll send your taste buds flying up to the roof of your mouth. Imagine that nice divine rush of peaches gracefully floating against your tongue on the inhale while on the exhale you’ll notice that smooth, creamy sensation and taste that’ll combine with the peaches leaving you in complete awe of pure satisfaction. Peach by Skwezed captures that authentic moment of enjoying a nice juicy toothsome peach. It’s got that full sweetness that peaches tend to have along with the same nectarine punch giving your taste buds a heck of a time when vaping on this juice. On the inhale you’ll feel that gush of freshly picked peaches with its nice honeyed tones, and on the exhale you’ll grasp that earthy but nectareous aftertaste that peaches leave after taking those juicy bites. If you want to save time out of the day to not have to pick the pistachios out of its shell, then now is your time to shine. Pistachio Krem by Skwezed not only gives you that nutty flavor that pistachios give off, but it’s also into the wonderful world of nut-based milk. Like almond milk, this juice has made you feel like you’ve drenched your tongue in pistachio milk. You’ll taste the earthy and slight sweetness of pistachios on the inhale and the silky smooth creamy sensation of milk on the exhale creating a vape flavor that has both nutty and milky combined into one hit. Skwezed 100ml vape juice is the perfect go-to flavor when looking for pure and authentic flavored vape juice that are simple but are packing with a lush flavor that will never disappoint.